When it comes to winter, there's a lot to think about. The colder it gets where you live, the more you have to do to prepare and deal with it on a daily basis. 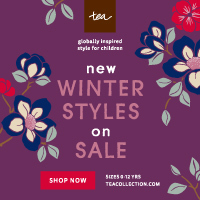 Dressing older toddlers or children is pretty straight forward, but gearing up an infant or younger toddler for winter can be something else! It's frustrating to bundle them up, only to have to undress them when you get to the car, redress them before you get out of the car, and then undress them again when indoors so they don't overheat. As any parent knows, it can be hard to get out of the house with one child, and even harder to get out of the house with multiples. Most parents can relate to thinking, "Oh forget it, it's just easier to stay home." Baby E was only a few months old when winter hit in 2012. I was a bundle of nerves. How would I know if he's too cold? 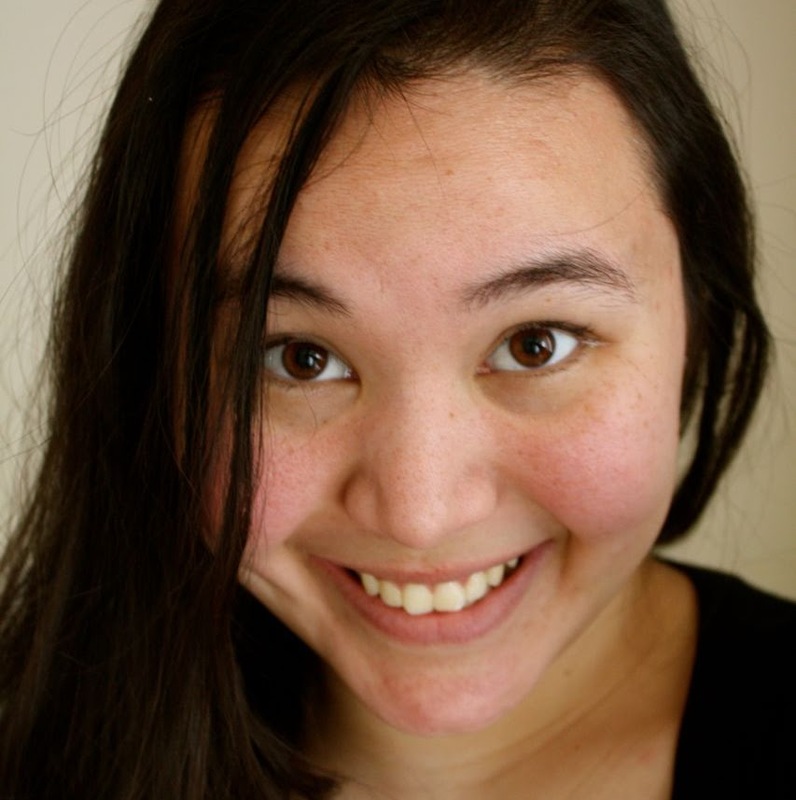 My husband's idea of cold and my idea of cold are very different, so how could I know what cold was to my little baby, when he couldn't tell me? What if I didn't bundle him up enough and he was freezing? Or what if I overdressed him and he was uncomfortable? Having to constantly to remove and put on layers didn't do anything to take away from my stress about it. My tension and worry about it lasted all winter, and my worries melted away with the snow in the spring. This year, I'm no longer a newbie mama, and with a little research, I have found the perfect system. It has allowed me to leave behind the stress this year and actually enjoy winter for all the things I love about it. One of the things I really wish I knew about last year, are Stonz! Stonz has a variety of products that help you be prepared for whatever the elements throw at you. Stonz Booties are available in a range from newborn to 3 year olds. 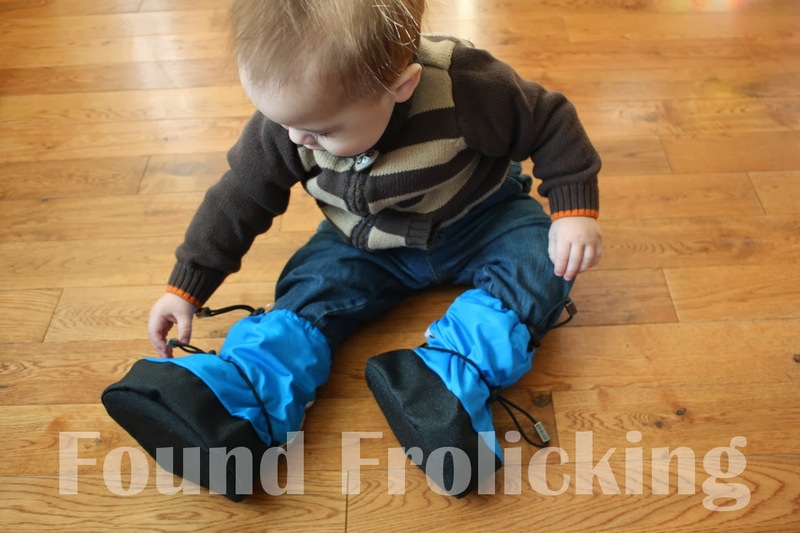 They also make Winter Bootz and Rain Bootz for ages 1-14. You can get a lot of your essential winter shopping done by purchasing their excellent Mitz and Hatz to match your Stonz Booties. 1. Use alone, putting only socks on your little one before putting on the Stonz Booties. 2. Use with Stonz Linerz, thick and soft, pairing Linerz with your Booties are a very warm option. 3. Use over your little one's shoes, making it quick and easy to slip on when you head outdoors, and take off when you're back inside. 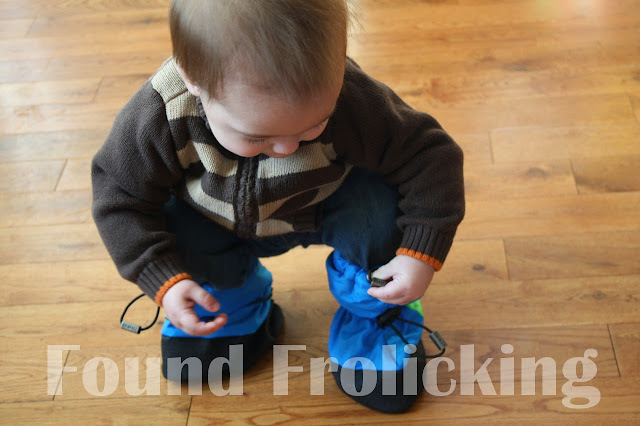 Putting hard shell boots on an infant or young toddler can become a long process. Between all of their squirming, and having to triple-check whether their feet are really in the foot bed like they should be, it can be a lot of hassle. I noticed immediately how very effortless it was to slip Baby E's feet into the Stonz Booties, tighten them up, and get out the door! Because they are not clunky like regular boots, too, they are easy to throw in the washing machine once they've gotten dirty---just turn them inside out and wash on a gentle cycle. I would recommend putting them in a mesh dryer bag when washing them to ensure they stay in tip-top shape. 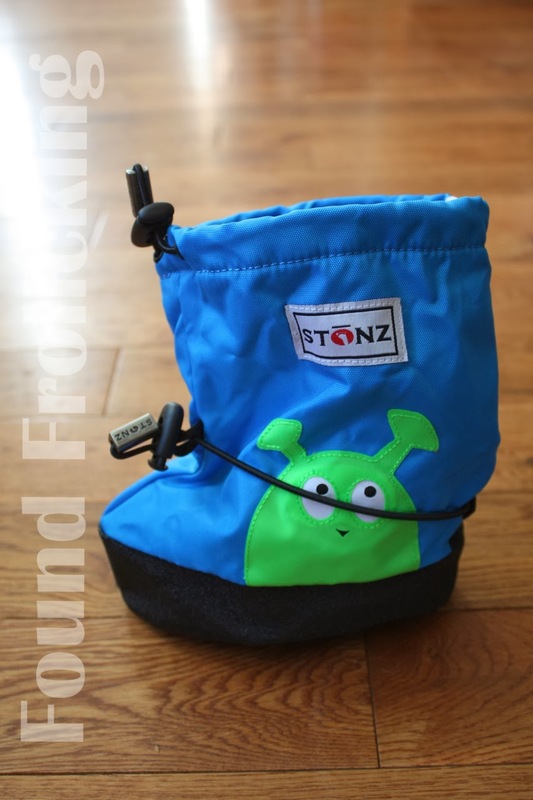 I love how adorable Stonz Booties are, too! 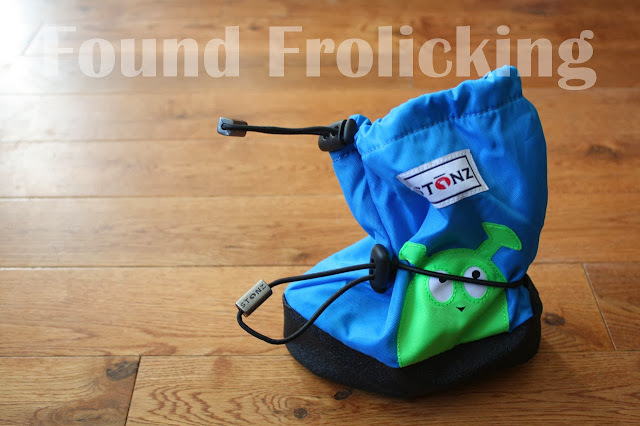 There are many designs Stonz come in, and they have a cute chunky look when being worn by your little one that reminds me of a pony. At $43.99 per pair, they are also competitively priced and very reasonable. It's also worth noting that unlike a lot of the competing brands, Stonz are made in Canada! I'm grateful to have Stonz Booties to make it easier to get out the door with Baby E, for work or play. Purchase your own Stonz Booties, and check out all of the products they have to offer today. You can see all this and more on their website, by clicking here. You can also find Stonz on their Facebook page, their Twitter account, follow them on Pinterest, and check out their YouTube channel StonzVideos! 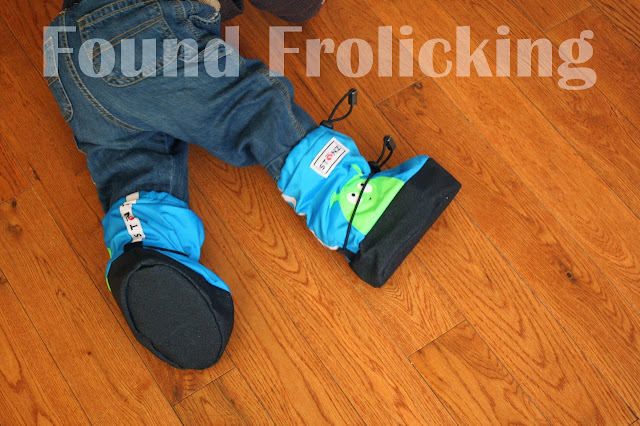 Alien Blue Stonz Booties size Large on my son at 12-month-old. 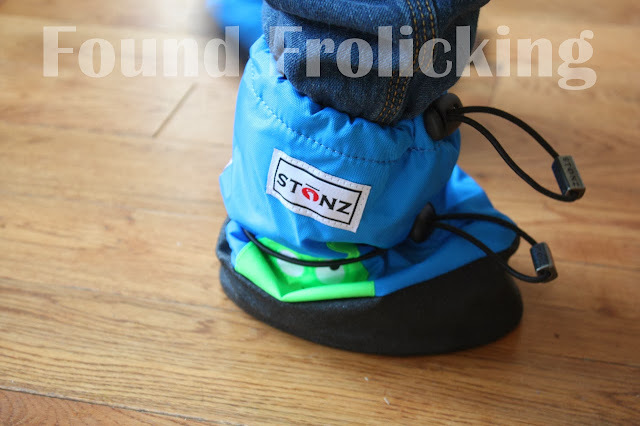 An example of how Stonz Booties look before you put them on your little one. What Stonz Booties will look like when worn. Two quick adjustments, and you are done! 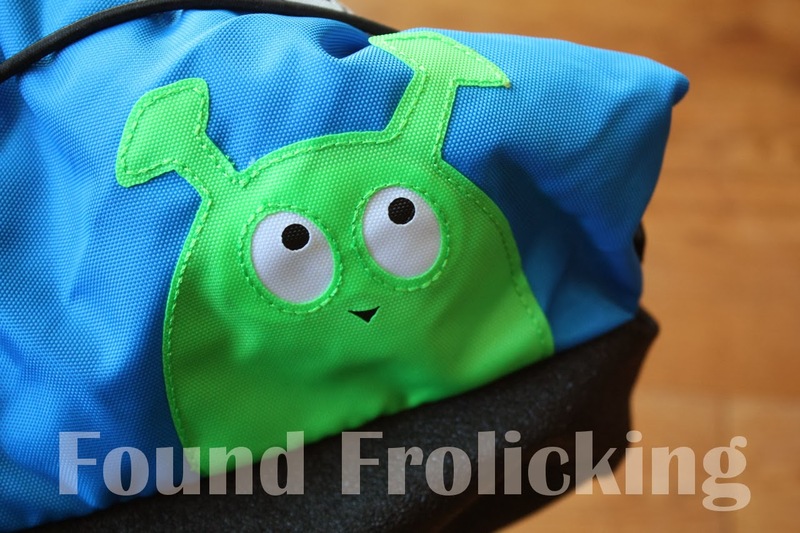 Detail on the adorable alien design on the Stonz Booties. Baby E standing up in his Stonz Booties. In this photo Baby E is checking out his Stonz Booties for the first time! Stonz Booties are soft and flexible, perfect for your little one's growing feet. 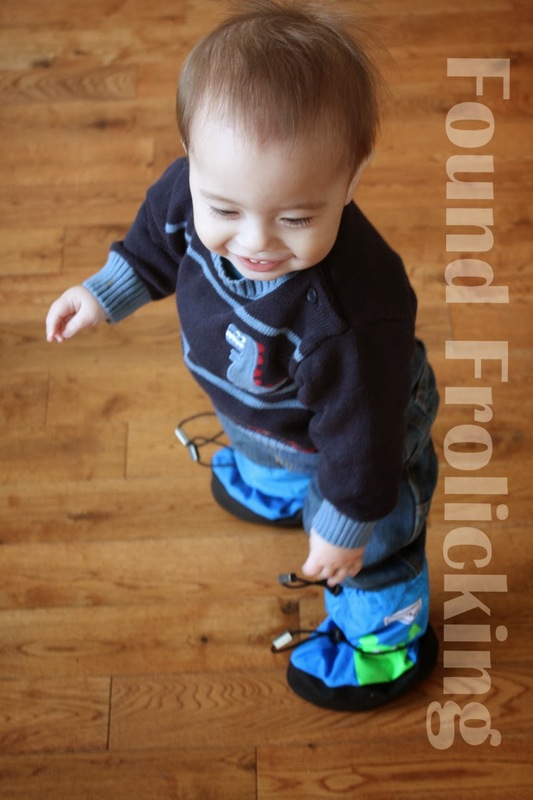 With Stonz Booties, your little one will have no trouble walking, or crawling! Disclosure: This product was received by myself free of charge, in exchange for an honest review. I received no monetary compensation for my thoughts that are expressed above. All opinions expressed are my own, and were in no way influenced by the brand or any other sources. The review and all photos with the watermark are the property of Found Frolicking, and should not be used or distributed in any way without first receiving permission. What a smart idea! I was initially bummed that I live in Florida and will very rarely need to prepare my kiddo for snow. Rain, however, that we get plenty of! These are perfect!